Getting shaky — many (hundreds to thousands) of small earthquakes, indicating that magma is on the move. The quakes may be the result of the magma forcing the surrounding rocks to crack, or a harmonic vibration that is evidence of magmatic fluids moving underground. Blowing off steam — steam eruptions (a.k.a. phreatic eruptions) that happen when magma near the surface heats groundwater to the boiling point. The water eventually explodes, sending fragments of the overlying rock far into the air. With these signs in mind, we can make a list of the equipment we should have and the actions we can take to monitor a volcano and predict when it might erupt. 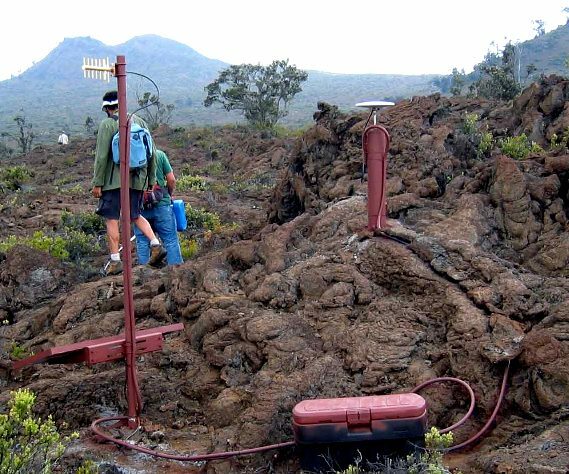 Assessing seismicity: The simplest and cheapest way to monitor a volcano is with seismometers. In an area with several volcanoes that have the potential to erupt (e.g., the Squamish-Pemberton area), a few well-placed seismometers can provide us with an early warning that something is changing beneath one of the volcanoes, and that we need to take a closer look. There are currently enough seismometers in the Lower Mainland and on Vancouver Island to provide this information. If there is seismic evidence that a volcano is coming to life, more seismometers should be placed in locations within a few tens of kilometres of the source of the activity (Figure 4.26). This will allow geologists to determine the exact location and depth of the seismic activity so that they can see where the magma is moving. Detecting gases: Water vapour quickly turns into clouds of liquid water droplets and is relatively easy to detect just by looking, but CO2 and SO2 are not as obvious. It’s important to be able to monitor changes in the composition of volcanic gases, and we need instruments to do that. Some can be monitored from a distance (from the ground or even from the air) using infrared devices, but to obtain more accurate data, we need to sample the air and do chemical analysis. This can be achieved with instruments placed on the ground close to the source of the gases (see Figure 4.17), or by collecting samples of the air and analyzing them in a lab. Measuring deformation: There are two main ways to measure ground deformation at a volcano. One is known as a tiltmeter, which is a sensitive three-directional level that can sense small changes in the tilt of the ground at a specific location. Another is through the use of GPS (global positioning system) technology (Figure 4.27). GPS is more effective than a tiltmeter because it provides information on how far the ground has actually moved — east-west, north-south, and up-down. By combining information from these types of sources, along with careful observations made on the ground and from the air, and a thorough knowledge of how volcanoes work, geologists can get a good idea of the potential for a volcano to erupt in the near future (months to weeks, but not days). They can then make recommendations to authorities about the need for evacuations and restricting transportation corridors. Our ability to predict volcanic eruptions has increased dramatically in recent decades because of advances in our understanding of how volcanoes behave and in monitoring technology. Providing that careful work is done, there is no longer a large risk of surprise eruptions, and providing that public warnings are issued and heeded, it is less and less likely that thousands will die from sector collapse, pyroclastic flows, ash falls, or lahars. Indirect hazards are still very real, however, and we can expect the next eruption like the one at Laki in 1783 to take an even greater toll than it did then, especially since there are now roughly eight times as many people on Earth. You’re the chief volcanologist for the Geological Survey of Canada (GSC), based in Vancouver. At 10:30 a.m. on a Tuesday, you receive a report from a seismologist at the GSC in Sidney saying that there has been a sudden increase in the number of small earthquakes in the vicinity of Mt. Garibaldi. You have two technicians available, access to some monitoring equipment, and a four-wheel-drive vehicle. At noon, you meet with your technicians and a couple of other geologists. By the end of the day, you need to have a plan to implement, starting tomorrow morning, and a statement to release to the press. 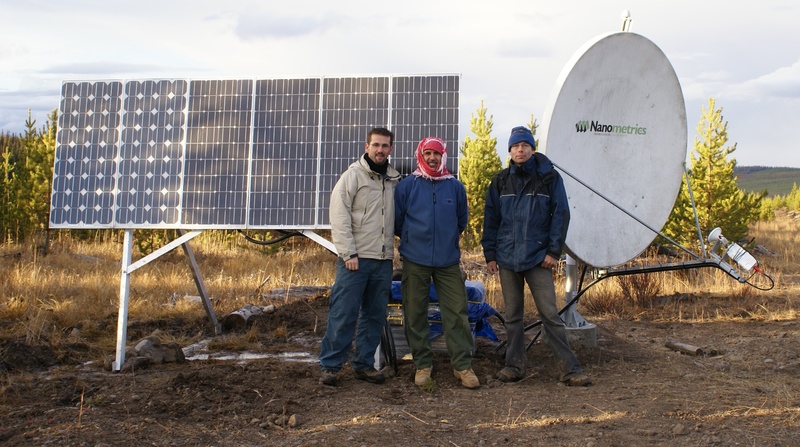 What should your first day’s fieldwork include? What should you say later today in your press release? 4.5 Monitoring Volcanoes and Predicting Eruptions by Steven Earle is licensed under a Creative Commons Attribution 4.0 International License, except where otherwise noted.